Shimshon Bichler and Jonathan Nitzan write: This is the second in our Contours of Crisis paper series. The first article set the stage for the series. It began by outlining the conventional view that this is a finance-led crisis, that this turmoil was triggered and amplified by “financial excesses”; it then described the domino sequence of collapsing markets—a process that started with the meltdown of the U.S. housing and FIRE sectors (finance, insurance and real estate), expanded to the entire financial market, and eventually pulled down the so-called “real economy”; and, finally, it situated the pattern and magnitude of the current decline in historical context. 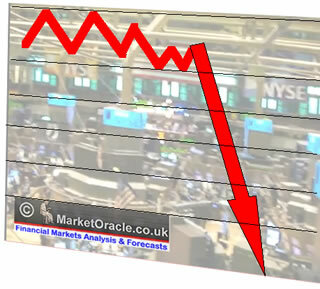 The current market collapse is very significant. Even after their last month’s rise, U.S. equity prices, measured in constant dollars, remain 50% below their 1999 peak—a decline comparable to the previous major bear markets of 1905-1920, 1928-1948 and 1968-1981. For many observers, though, the depth of the financial crash also implies that much of it may be over, and that the boom bulls will soon oust the doom bears. Predicting boom out of doom isn’t far fetched. Equity markets are highly cyclical, and their gyrations are remarkably stylized. As our first article showed, over the past century the United States has experienced several major bear markets with very similar patterns: they all had more or less the same duration, they all shared a similar magnitude, and they all ended in a major bull run. In other words, there seems to be a certain automaticity here, and automaticity gives pundits the confidence to extrapolate the future from the past. But this automaticity is more apparent than real. Finance, we pointed out, is not an independent mechanism that goes up and down on its own. In this sense, the long-term movements of the equity market are not “technical” swings, but rather reflections and manifestations of deep social transformations that alter the entire structure of power. During the past century, every transition from a major bear market to a bull run was accompanied by a systemic reordering of the political economy: the 1920–1928 upswing marked the transition from robber-baron capitalism to big business and synchronized finance; the 1948–1968 uptrend came with the move from “laissez faire” capitalism to big government and the welfare-warfare state; and the 1981–1999 boom coincided with a return to liberal regulation on the one hand and the explosive growth of capital flows and transnational ownership on the other. So what should we expect in the wake of the current crisis? What type of transformation can pull capitalism out of its current rout? How will this transformation be brought about, by whom and against what opposition? Can this transformation be achieved—and what might the consequences be if it fails? Unfortunately, these questions cannot readily be answered for two basic reasons. The first reason concerns our very inability to transcend the present. Contrary to what the prophets of economics and the fortunetellers of finance like to believe (though consistently fail to demonstrate), the future of society is largely unknowable. It is of course true that, in retrospect, many historical developments appear obvious, if not inevitable. Looking back, the transition of the 1920s to big business and synchronized finance, the emergence during the 1940s and 1950s of large governments and the welfare-warfare state, and the imposition since the 1980s of neoliberal regulation and freely flowing finance all seem to make perfect sense. These transformations succeeded in resolving the crises that preceded them, and that success makes them look predestined. But note that before they happened, these transformations were almost unthinkable. Few if any of the experts saw them coming, and their precise nature remained opaque until the ensuing social restructuring was more or less complete. The key difficulty of anticipating such transformations is novelty. Fundamental social change creates something new, and what is truly new can never be predicted. According to Hegel and Marx, no individual—not even the best paid market wizard—can transcend her own epoch. The consciousness of social individuals—and certainly of those convinced that they are “independent” and “rational”—is largely a collective creature, molded by the political-economic order to which they are subjugated. This subjugation makes it difficult for anybody—including critics of capitalism—to jump over Rhodes and anticipate a different future. And, indeed, it is only in hindsight and after much rationalization that the ideologues start to characterize new developments as “unavoidable” and that the econometricians begin to build models that “could have” predicted them. It is only after the fact that the fore-tellers have known it all along. What brought this sudden conceptual disintegration? Why has “our world”—i.e., the world according to the financiers—broken down? What caused the “intellectual edifice” to collapse and the “pillars of faith” to crumble? How could so solid an ideology become so useless, so quickly? Financial crisis, tells us György Lukács, threatens the foundations of the capitalist regime. The ruling class loses its self-confidence and begins to substitute ad-hoc excuses for natural-state-of-things theories. And as the ideological glue that holds the regime together weakens, class conflict becomes visible through the cracks of universal rhetoric, while naked force suddenly looms large behind the front window of tolerance. Unfortunately, these justifications all miss the point. The key question to ask is not what the economists disagree on, but what they all agree on. And what the vast majority of them consider as true is the mismatch thesis: i.e., the conviction that the basic cause of the current crisis is a discrepancy between nominal finance and the so-called “real” economy. The essentials of the mismatch thesis are simple enough. The thesis argues that, over the past decade, the nominal world of finance has deviated from and distorted the “real” world of accumulation. Finance, say the thesis’ adherents, has inflated into a bubble; the bubble has grown to become much bigger than the underlying “real” capital it was supposed to represent; and since there is no such thing as a free lunch, the current crash is the inevitable price we all have to pay for failing to prevent this discrepancy. Naturally, the mismatch thesis, like other basic theories, comes in a wide variety of flavors sparkled with colorful debates. But its underlying principles are broadly accepted by both liberals and radicals, and few if any question their general validity. This intellectual complacency, we argue, is grossly misplaced. As we shall see later in the article, the thesis itself does not withstand scrutiny. But the problem begins before we even get to the thesis: it starts with the very assumptions the argument is built on. There are three key assumptions. The first is that nominal finance and “real” capital are two quantitative entities that can be measured. The second is that these two quantities can be measured independently of each other—one in money units, the other in hedonic-productive units. And the third is that, under ideal circumstances, the two quantities should be equal, so that the magnitudes of nominal finance and “real” capital are the same. Unfortunately, none of these assumptions holds water. Stated briefly, the first problem is that, while finance has a definite quantity denominated in dollars and cents, “real” capital does not: its units—whatever they are—cannot be measured. Economists pretend to solve the impasse by using a proxy measure, but their solution creates a second problem. The proxy they use is not “real,” but nominal: instead of material units, it’s counted in dollars and cents! Finally, even this nominal expression of “real” capital doesn’t do the trick: it rarely equals the magnitude of finance and, moreover, it tends to oscillate in an opposite direction! These considerations lead to two distinct options, both unpalatable. If we accept that “real” capital doesn’t have a quantity, it follows that finance has nothing to match and therefore nothing to mismatch. And if we concur with the economists and use their nominal proxy, we end up with a pseudo “real” capital that rarely if ever matches the quantity of finance. In other words, we end up with a theory that is almost always wrong—a conclusion which in turn means either that capital suffers from a chronic split personality, or that the economists simply don’t know what they are talking about. With this overview in mind, let us now turn to the details, beginning with the underlying separation between the “real” and the nominal. Modern economics, both mainstream and heterodox, starts from a basic duality. According to this view, first spelled out in the eighteenth century by philosopher David Hume, the economy consists of two distinct spheres: “real” and nominal. The important sphere is the “real” one. For the liberals, this is the domain of scarcity, the sphere where demand and supply allocate limited resources between unlimited wants. For the Marxists, this is the bedrock of the class struggle, the arena where workers produce value and capitalists exploit them through the appropriation of surplus value. Taken in its totality, the “real” economy is the site where production and consumption take place, where sweat and tears are shed so that desires can be fulfilled, where factors of production mix with technology, where capitalists invest for profit and workers labor for wages, where conflict clashes with cooperation, where anonymous market forces meet the visible hand of power. It’s the raison d'être, the locus of action, the means and ends of economics. It is the real thing. The nominal economy merely reflects this reality. Unlike the “real” economy, with its productive efforts, tangible goods and useful services, the nominal sphere is entirely symbolic. Its various entities—fiat money, credit and debt, equities and securities—are all denominated in dollars and cents. They are counted partly in minted coins and printed notes, but mostly in electronic bits and bytes. This is a parallel universe, a world of mirrors and echoes. Whether accurate or inaccurate, it a mere image of the real thing. This duality of the “real” and the nominal pervades all of economics, including the concept of capital. Here, too, there are two types of capital: “real” capital, or wealth, and financial capital, or capitalization. “Real” capital is made of so-called capital goods. It comprises means of production—plant and equipment, infrastructure, work in progress and, according to many economists, also knowledge. Financial capital, by contrast, is the symbolic ownership claims on capital goods. It exists as nominal “capitalization”—namely, as the present value of the earnings that the capital goods are expected to generate. The three-step sequence in Table 1 goes as follows. In step 1, the stock of “real” capital goods, or what economists think of as “wealth,” generates future income services. For example, in an Intel factory, the machines comprise the “real” capital wealth that exists here and now, while the microchips that these machines will (supposedly) produce constitute the future income services. In step 2, the future income services become future income value. This conversion will happen in the future, when Intel’s owners sell the microchips in return for dollars and cents. However, step 3 shows us that the owners of Intel don’t have to wait until the income services are produced and the income value is earned. They can easily capitalize, or “discount,” these flows, here and now. This capitalization closes the circle. It brings the future income flows to their “present value,” and by so doing helps the owners convert their physical capital wealth into a financial capital value. Nowadays, after a century of economic and financial indoctrination, the informed reader may find this process fundamental, if not trivial. But in fact, it is neither fundamental nor trivial. If anything, it is fundamentally wrong. Let’s see why. The first question to ask is why do economists need two spheres to begin with—particularly when one sphere is simply a mirror image of the other? Why worry about the nominal Idea when one already knows the “real” Thing itself? Isn’t this duplication redundant, not to say irrational and wasteful? For most economists, the answer to the last question is a resounding yes: the nominal sphere is definitely redundant. Money may be useful as a “lubricant,” a way to lessen the friction of a barter economy. But that is just a sidekick. Analytically, money is no more than a duplicate. “There cannot, in short, be intrinsically a more insignificant thing, in the economy of society, than money,” declares nineteenth-century economist John Stuart Mill. [Note 11] And that view hasn’t changed much since it was first pronounced: “Money is ‘neutral,’ a ‘veil’ with no consequences for real economic magnitudes,” reiterates twentieth-century Nobel Laureate Franco Modigliani. [Note 12] These are not misquotes. Open any economics textbook and you’ll find almost all of it denominated and analyzed solely in “real” terms. In theory, the only thing that matters is the “real” economy. The nominal side is entirely redundant. But this theoretical posture is mostly for show. In practice, economists can do very little without the nominal world, and for a very simple reason. As it turns out, their so-called “real” economy cannot be measured directly. The only way to count its quantities is indirectly, by looking at the economy’s nominal mirror. And here there arises a tiny problem. If economists see the reality only through its reflections, how can they ever be sure that what they see is what they get? As we have seen, economists begin with two parallel sets of quantities—“real” and nominal—and, in line with this duality, assume that the value of finance, measured as capitalization, is equal to the amount of wealth embedded in capital goods. But there is a clear pecking order here. The key is “real” capital. This is the productive source of the entire process. “Real” capital is what generates future income services, which, in turn, become future income value; and it is this future income value that gets discounted into the present value of nominal finance. In other words, the whole exercise is benchmarked against the material-productive quantity of “real” capital. A mirror can only reflect that which already exists, and that requirement cannot be bypassed. In order to compute the quantity of nominal finance, we first need to know the quantity of “real” capital. And yet this prerequisite cannot be fulfilled. It turns out that the quantity of “real” capital is a pure fiction. Nobody has ever been able to measure it, and for the simplest of reasons: it doesn’t exist. Although economists like to mystify and obscure the issue, the gist of the problem is fairly easy to explain. Commodities are qualitatively different entities. Apples are different from microchips, just as automobile factories are different from oil rigs. These differences mean that we cannot compare and aggregate such entities in their own natural units. The solution to this diversity is to devise a “fundamental quantity” common to all commodities, a basic measure that all commodities can be expressed in or reduced to. This method underlies the natural sciences. In physics, for example, the basic measurement units are mass, distance, time, electrical charge and heat. These are the fundamental quantities from which all other physical quantities derive: velocity is distance divided by time; acceleration is the rate of change of velocity; force is the product of mass and acceleration; etc. In this way, every commodity—including the various artifacts of “real” capital—can be measured in terms of a universal unit (with the particular choice depending on the economist’s theoretical preference). And once the reduction is achieved and the commodity quantified in util or abstract-labor terms, everything else falls into place. To illustrate, a liberal statistician might determine Intel’s productive capacity as equivalent to 1 trillion utils, to be generated over the life span of the company’s “real” capital; this flow of income services would then give rise to $50 billion of net income value; and, to close the circle, this income value, properly discounted to its present value, would be worth $200 billion in nominal market capitalization. Now, since the statistician is using fundamental quantities, she can easily compare different companies. For instance, if ExxonMobil has 2 trillion utils’ worth of productive capacity—that is, twice as much as Intel’s—its market capitalization should also be twice that of Intel’s—i.e., $400 billion. A Marxist statistician would compute things a bit differently. Recall that “real” capital here is measured in terms not of the utils it generates but of the abstract labor time socially necessary to produce it. In our example, if the “real” capital of Exxon-Mobil requires 10 million hours of socially necessary abstract labor to produce, while that of Intel takes only 2 million, their relative magnitudes is 5:1. And if the dollar capitalization of the two companies were to reflect this ratio, ExxonMobil would have a financial worth five times larger than Intel’s. This quantitative correspondence between financial and “real” capital is the foundation of the mismatch thesis. The liberal version of the thesis begins by assuming that the two magnitudes should match—and then uses various distortions to justify their mismatch. The Marxists start from the other end. They assume that capitalism has a built-in tendency that drives these two magnitudes apart—and then use crisis to bring them back to a match. [Note 13] But both versions—whether they begin from a match or a mismatch—hinge on the quantity of “real” capital. This quantitative benchmark is the ultimate “reality” that financial capital supposedly matches or mismatches. The only problem is that this “reality” is really a fiction. The simple fact is that, unlike physicists, economists have never managed to identify, let alone calculate, their fundamental quantities. Whereas mass, distance, time, electrical charge and heat are readily measurable, no liberal has ever been able to observe a util, and no Marxist has ever seen a unit of abstract labor. Needless to say, this inability to measure utils and abstract labor is a make-or-break junction. If these indeed are invisible, not to say logically impossible, units, they cannot be used to measure the quantity of commodities—including the quantity of “real” capital. And if the magnitude of “real” capital is unknown if not unknowable, what then is left of the mismatch thesis? Thus, for a liberal, a 1:3 price ratio between two Toyota factories means that the latter has three times the util-generating quantity of the former. Similarly, for a Marxist, this ratio is evidence that the abstract labor quantity of the second factory is three times that of the first. Unfortunately, this logic makes us go in a circle. Recall that the starting point of the mismatch thesis is an ideal equality between the money quantity of capitalization and the “real” quantity of capital. But now it turns out that the “real” quantity of capital—the entity that nominal finance supposedly equals to and unfortunately distorts—is itself nothing but ... money! So, in the end, there is no “real” benchmark—and yet, without such benchmark, what exactly is there to mismatch? At this point, the mismatch theorists—i.e., the vast majority of economists—should have packed up and gone home. Of course, this departure never happened—nor is it likely to occur anytime soon. The economists, for all their mischief, remain in the sweet spot. Contrary to the textbook ideal, the market for economic ideology is neither perfectly competitive nor fully informed. The economists retain the exclusive right to produce and sell the “economic” omens. And as long as the laity fails to see that the sellers are partly naked and the ideological merchandise often rotten, the buyers continue to pay, the market continues to clear, and the racketeers continues to prosper. Now, this new setup, although logically faulty, if not circular, has one important advantage: it enables a “pragmatic” test. The nominal proxy for “real” capital now is fully observable and therefore readily comparable to the corresponding magnitude of financial capitalization. All we have to do is measure and see. The economic scriptures, summarized in Table 1 above, tell us that the two magnitudes should be mirror images of each other. But the facts say otherwise. Figure 1 compares the so-called “real” and financial sides of two leading U.S. firms—Microsoft and General Motors (GM). Keeping with our vow, we go along with the economists and assume here that the productive capacity of each company—namely, its “real” capital—can be measured by the dollar value of its capital goods. There are four sets of bars in the chart, each presenting a different type of facts about the two companies. The grey bars are for GM, the black ones for Microsoft. On top of each of the Microsoft bars, we denote the percent ratio of Microsoft relative to GM. The two sets of bars on the left present data on the “material” operations of the two firms. 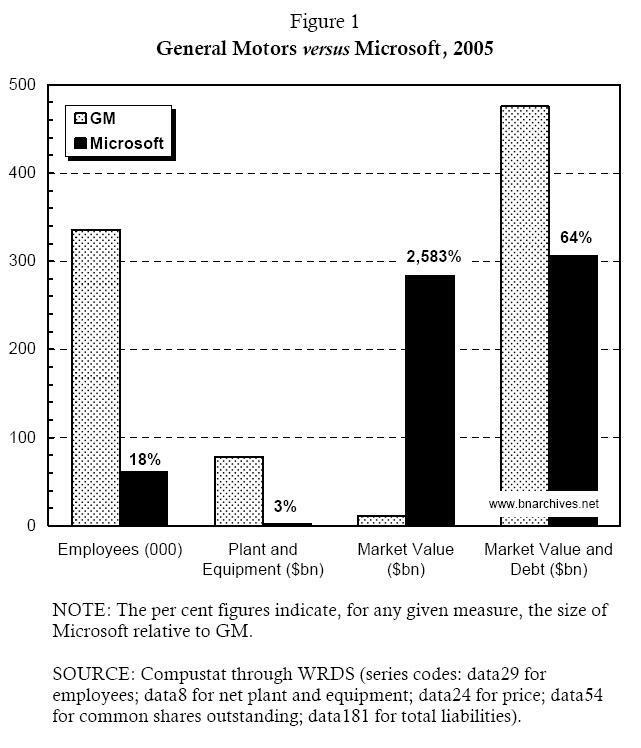 In terms of relative employment, depicted by the first set, GM is a giant and Microsoft is a dwarf. In 2005, GM had 335,000 workers, 5.5 times more than Microsoft’s 61,000. The second set of bars denotes the respective dollar value of the companies’ plant and equipment, measured in historical cost (i.e. the original purchase price). In line with our concession, we assume that these dollar values are proportionate to the “productive capacity,” or the “real” capital of the two companies. According to these statistics, in 2005 the “real” capital of GM, standing at $78 billion, was 33 times larger than Microsoft’s, whose capital goods were worth a mere $2.3 billion. The two sets of bars on the right show the companies’ respective capitalization—that is, the magnitude of their nominal finance. Here the picture is exactly the opposite, with Microsoft being the giant and GM the dwarf. In 2005, Microsoft’s equity had a market value of $283 billion, nearly 26 times GM’s $11 billion. And even if we take the sum of debt and market value (which supposedly stands as the total claim on a company’s “real” capital), the GM total of $475 billion was only 55% greater than Microsoft’s $306 billion—a far cry from its relatively huge workforce and massive plant and equipment. The usual response to such a discrepancy, from Alfred Marshall onward, points to “technology” and “human capital.” This is the “knowledge economy,” the experts tell us. Obviously, Microsoft’s disproportionate market value must be due to its superior know-how, packed as “immaterial” or “intangible” assets. 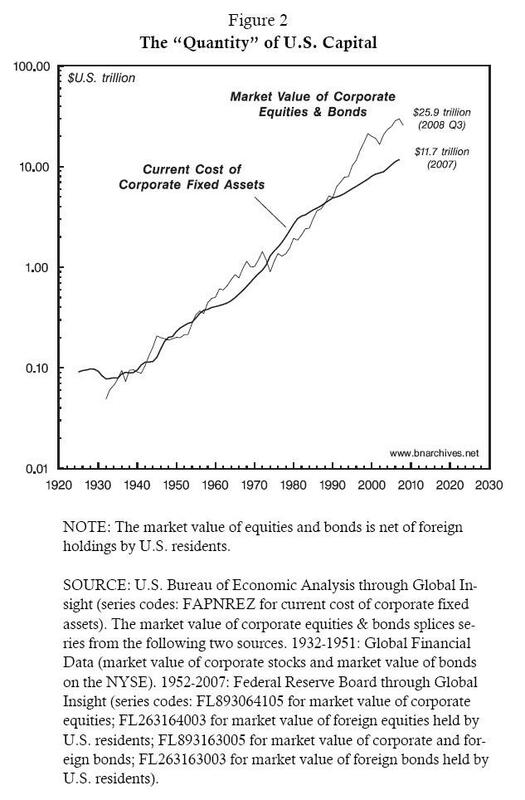 And since intangibles are not included in the fixed assets of corporate balance sheets on the one hand yet bear on market capitalization on the other, we end up with a market value that deviates, often considerably, from the tangible stock of “real” capital. This is a popular academic claim, and for good reason: it is entirely reversible and totally irrefutable. To illustrate, simply consider the reverse assertion—namely that GM has more know-how than Microsoft. Since nobody knows how to quantify technology, how can we decide which of the two claims is correct? The discrepancy between capitalization and “real” capital is by no means limited to individual firms or particular time periods. In fact, it appears to be the rule rather than the exception. Figure 3 calibrates these differences. The chart plots the so-called Tobin’s Q ratio for the U.S. corporate sector from 1932 to 2008 (with the last year being an estimate). 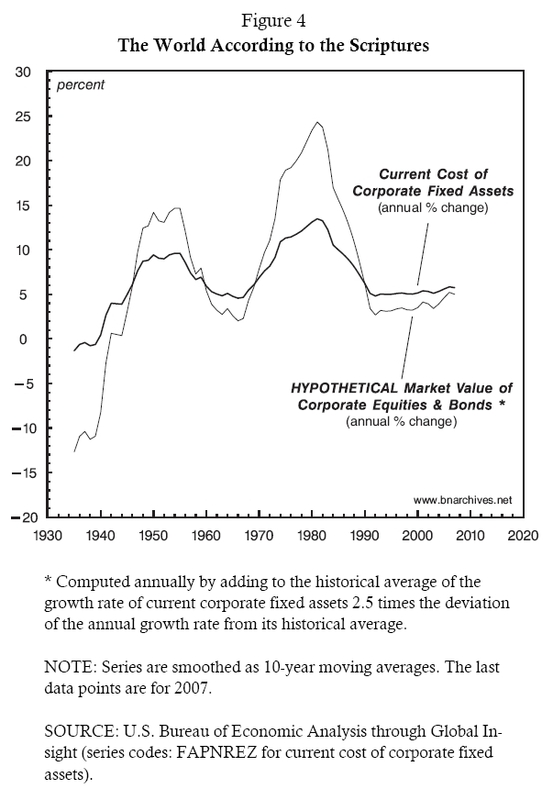 [Note 20] In this figure, Tobin’s Q measures the ratio between corporate capitalization and capital goods: for each year, the series takes the market value of all outstanding corporate stocks and bonds and divides it by the current replacement cost of corporate fixed assets. Since both magnitudes are denominated in current prices, the ratio between them is a pure number. Here too we uphold our theoretical concession. We assume that Fisher’s symmetry between “real” assets and dollar capitalization, although failing the materialistic test, can still hold in nominal space. Now, if this assumption were true to the letter, Tobin’s Q should have been 1. One dollar’s worth of “real” assets would create a definite future flow of money income, and that flow, once discounted, would in turn generate one dollar’s worth of market capitalization. The facts, though, seem to suggest otherwise. There are two clear anomalies. First, the historical mean value of the series is not 1, but 1.3. Second, the actual value of Tobin’s Q fluctuates heavily—over the past 77 years it has oscillated between a low of 0.6 and a high of 2.8. Moreover, the fluctuations do not look random in the least; on the contrary, they seem fairly stylized, moving in a wave-like fashion. Let’s inspect these anomalies in turn. Why is the long-term average of Tobin’s Q higher than 1? The conventional answer points to mismeasurment. To reiterate, fixed assets consist of plant and equipment; yet, as we have already seen in the case of Microsoft vs. GM, capitalization supposedly represents the entire productive capacity of the corporation—in other words, more than just its physical plant and equipment. And since Tobin’s Q measures the ratio between the whole and only one of its parts, plain arithmetic tells us the result must be bigger than 1. But, then, how much bigger? Even if we accept that there is mismeasurement here, the question remains as to why Tobin’s Q should average 1.3, rather than 1.01 or 20 for instance. And here, too, just like in the case of Microsoft vs. GM, the answer is elusive. To pin down the difficulty, let’s examine the structure of a balance sheet a bit more closely. Economists and accountants tell us that corporations have two types of assets: tangible and intangible. [Note 21] According to their standard system of classification, tangible assets consist of capital goods—machines, structures and recently also software. Intangible assets, by contrast, represent firm-specific knowledge, proprietary technology, goodwill and other metaphysical entities. Most economists (with the exception of some Marxists) consider both types of assets productive, and the accountants concur—but with a reservation. Although both tangible and intangible assets are deemed “real,” they cannot always be treated in the same way. The reason is prosaic. Tangible assets are bought and sold on the market and therefore have a universal price. Since the market is assumed to know all, this price is treated as an objective quantity and hence qualifies for inclusion in the balance sheet. By contrast, most intangible assets are produced by the firm itself. They are generated through internal R&D spending, in-house advertisement expenditures and sundry other costs associated with the likes of “corporate re-engineering” and “structural re-organization.” These are not arm’s-length transactions. They are not subject to the universalizing discipline of the market, and therefore the intangible assets they generate lack an “objective” price. And items that do not have an agreed-upon price, no matter how productive, cannot make it into the balance sheet. The best the accountants can do is list them as current expenditures on the income statement. There are two exceptions to the rule, though. One exception is when companies purchase pre-packaged intangibles directly through the market—for instance, by acquiring a franchise, patent, trademark, or copyright. The other is when one corporation acquires another at a price that exceeds the acquired company’s book value. Since the merger itself does not create new tangible assets, the accountants assume that the premium must represent the intangible assets of the new formation. They also assume that since this premium is determined by the market, it must be objective. And given that the intangibles here are objectively measured, the accountants feel safe enough to include them in the balance sheet. So all in all we have three categories of “real” capital: (1) tangible assets that are included in the balance sheet; (2) intangible assets that are included in the balance sheet; and (3) intangible assets that are not included in the balance sheet. Now, as noted, fixed assets comprise only the first category, whereas capitalization reflects the sum of all three; and, according to the conventional creed, it is this disparity that explains why the long-term average of Tobin’s Q differs from 1. The historical rationale goes as follows. Over the past several decades, U.S.-based corporations have undergone an “intangible revolution.” Their economy has become “high-tech,” with knowledge, information and communication all multiplying manifold. As a consequence of this revolution, the growth of tangible assets has decelerated, while that of intangible assets has accelerated. Applying this true-by-definition logic, a 2006 study of the S&P 500 companies estimates that, over the previous thirty years, the ratio between their market value and the book value of their tangible assets has risen more than fourfold: from 1.2 in 1975 to 5 in 2005. [Note 23] The increase implies that in 1975 intangibles amounted to 17% of the total assets, whereas in 2005 they accounted for as much as 80%. Much of this increase is attributed to the growth of out-of-balance-sheet intangibles, whose share of market capitalization during the period is estimated to have risen from 15 to 65%. This rationale may sound soothing to neoclassical ears, but accepting it must come with some unease. To begin with, the neoclassicists don’t really “measure” intangibles; rather, they deduce them, like the ether, as a residual. This deduction—whereby intangibles, like God’s miracles, are proven by our very inability to explain them—already gives the whole enterprise the mystical aura of an organized religion. And there is more. According to the neoclassicists’ own imputations, the residual accounted, at least until very recently, for as much as 80% of total market value. To accept this magnitude as a fact is to concede that the “measurable” basis of the theory, shaky as it is, accounts for no more than 20% of market capitalization—hardly an impressive achievement for a theory that calls itself scientific. Finally, the imputed results seem excessively volatile, to put it politely. Given that the quantity of intangibles is equal to the difference between market value and tangible assets, oscillations in market value imply corresponding variations in intangible assets. But, then, why would the quantity of a productive asset, no matter how intangible, fluctuate—and often wildly—even from one day to the next? And how could the variations be so large? Should we believe, based on the recent global collapse of market capitalization, that the corporate sector has just seen more than half of its intangible productive capacity evaporate into thin air? The solution to these riddles is to invoke irrationality. In this augmented neoclassical version, capitalized market value consists of not two components, but three: in addition to tangible and intangible assets, it also includes an amount reflecting the excessive optimism or pessimism of investors. And this last component, goes the argument, serves to explain the second anomaly of Tobin’s Q—namely its large historical fluctuations. This irrationality rationale is illustrated in Figure 4. To explain it, let’s backtrack and refresh the basics of rational economics. During good times, goes the argument, capitalist optimism causes investors to plough back more profits into “real,” productive assets. During bad times, the process goes in reverse, with less profit earmarked for that purpose. As a result, the growth of “real” assets tends to accelerate in an upswing and decelerate in a downswing. This standard pattern is illustrated by the thick line in the figure. The line measures the rate of change of the current cost of corporate fixed assets (the denominator of Tobin’s Q), with the data smoothed as a 10-year moving average in order to accentuate its long term pattern. According to the figure, the U.S. corporate sector has gone through two very long “real” accumulation cycles (measured in current prices)—the first peaking in the early 1950s, the second in the early 1980s. The vigilant reader will note that the accumulation process here reflects only the tangible assets—for the obvious reason that the intangible ones cannot be observed directly. But this deficiency shouldn’t be much of a concern. Since neoclassical (and most Marxist) economists view intangible and tangible assets as serving the same productive purpose, they can assume (although not prove) that their respective growth patterns, particularly over long periods of time, are more or less similar. [Note 24] So all in all, we could take the thick line as representing the overall accumulation rate of “real” capital, both tangible and intangible (denominated in current dollars to bypass the impossibility of material quantities, measured in utils or abstract labor). Now this is where irrationality kicks in. 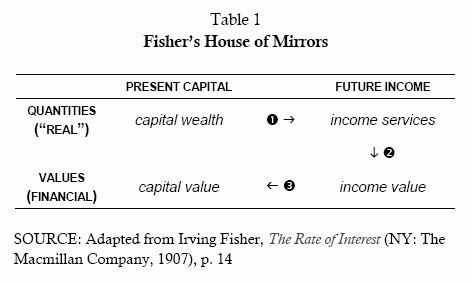 In an ideal neoclassical world—perfectly competitive, completely transparent and fully informed—Fisher’s “capital value” and “capital wealth” would be the same. 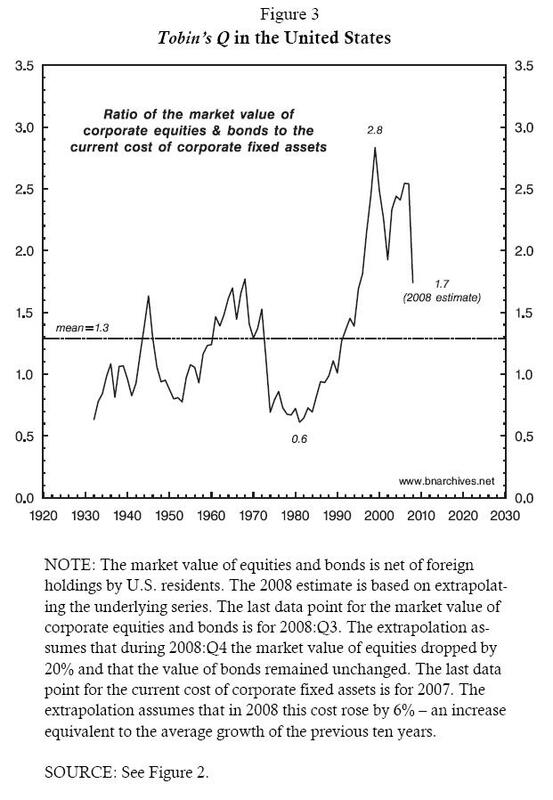 Capitalization on the stock and bond markets would exactly equal the dollar value of “real” tangible and intangible assets. The two sums would grow and contract together, moving up and down as perfect replicas. But even the neoclassicists realize that this is a mere ideal. Ever since Newton, we know that pure ideas may be good for predicting the movement of heavenly bodies, but not the folly of men. Newton learned this lesson the hard way after losing plenty of money in the bursting of the “South Sea Bubble.” Two centuries later, he was joined by no other than Irving Fisher, who managed to sacrifice his own fortune—$10 million then, $100 million in today’s prices—on the altar of the 1929 stock market crash. So just to be on the safe side, neoclassicists now agree that, although capitalization does reflect the objective processes of the so-called “real” economy, the picture must be augmented by human beings. And the latter, sadly but truly, are not always rational. Greed and fear cloud their vision, emotions upset their calculations and passion biases their decisions—distortions that are further amplified by government intervention and regulation, lack of transparency, insider trading and other such unfortunate imperfections. All of these deviations from the pure model lead to irrationality, and irrationality causes assets to be mispriced.